Here are 4 Free services that give you free US phone number. You can use these phone numbers to get free incoming calls, and in some cases, you can also make free outgoing calls in US. All these services are completely free. Google Voice is the best service right now to get a free US phone number. It lets you choose area code that you want, and you can even choose the phone number you want. You can get unlimited free incoming calls on that number from all over the world. You can forward those calls to any other phone number of your choice, or even receive them directly on “Call Phone” option in Gmail. 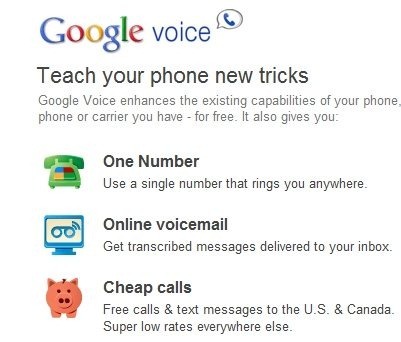 I have been using Google Voice since it was GrandCentral, and do not have a landline phone since then. I have it integrated with Gizmo5, and use a SIP adapter to get calls on a regular phone. Google voice lets you make unlimited calls to all over US and Canada, and voice quality is pretty amazing. So, your search for a free US phone number should start from here. Voxox is another free service that gives you a free US phone number. There is no catch with Voxox, and surprisingly, I still do not hear about this service a lot. 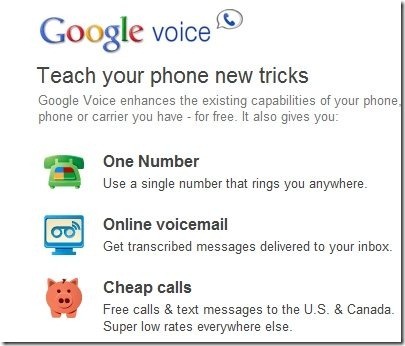 It works a lot like Google Voice, and offers almost all the same features that Google Voice does. You get a free US phone number. You can download a desktop client, and you can receive all the calls on that for free. It also lets you configure multiple phones, and can ring all of them when you get a call on your Voxox free US phone number. It also provides free incoming fax, and free SMS. Outbound calls with Voxox are not free, but are quite cheap. So, if you want a free US incoming phone number, Voxox is an easy service to use. In the sign-up process you are asked to provide a mobile number, and Voxox sends activation code on that. However, it supports lot of countries, so you do not need to have a US mobile number to get a Voxox number. Read more about Voxox, or try free here. Also check out free incoming fax number, and free Israel phone number. Whistle Phone is another free service that provides a free US phone number. As is with Voxox, it lets you receive incoming calls for free. The advantage that it offers over Voxox is that it also lets you make free outgoing phone calls all over US (except Alaska, and Hawaii). You can also install Voxox app on your iPod Touch or iPhone to make and receive free phone calls. IPKall is one of the most popular services to get free U.S. phone number. It provides free phone number in Washington state area. It needs to be combined with a SIP account, and a SIP enabled device. You can use it with a softphone like Blink. You can get free unlimited phone calls on your free phone number. Its limitation is that your account is deleted after 30 days if it is not active. However, if you are going to regularly use your phone number, then this is one of the best service to get a free US phone number. It has been around since quite a long time, and is still holding strong. If you are new to SIP, it might be a bit tricky to configure IPKall. Here is a good tutorial that explains how to configure and use IPKall.